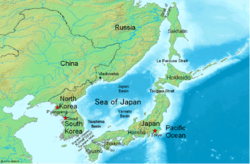 The Sea of Japan (see below for other names) is the marginal sea between the Japanese archipelago, Sakhalin, the Korean Peninsula and Russia. The Japanese archipelago separates the sea from the Pacific Ocean. It is bordered by Japan, Korea (North and South) and Russia. Like the Mediterranean Sea, it has almost no tides due to its nearly complete enclosure from the Pacific Ocean. This isolation also reflects in the fauna species and in the water salinity, which is lower than in the ocean. The sea has no large islands, bays or capes. Its water balance is mostly determined by the inflow and outflow through the straits connecting it to the neighboring seas and Pacific Ocean. Few rivers discharge into the sea and their total contribution to the water exchange is within 1%. 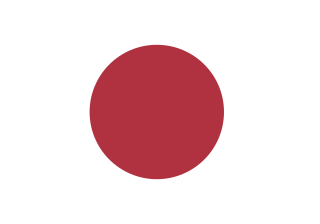 The Japanese archipelago is a group of 6,852 islands that form the country of Japan. It extends over 3,000 km (1,900 mi) from the Sea of Okhotsk northeast to the Philippine Sea south along the northeastern coast of the Eurasia continent. It consists of islands from the Sakhalin island arc, the Northeastern Japan arc to the Ryukyu islands and the Nanpō Islands. Sakhalin is Russia's largest island, lying in the North Pacific Ocean between 45°50' and 54°24' N. It is administered as part of Sakhalin Oblast. Sakhalin, which is about one third the size of Honshu, is just off the east coast of Russia, and just north of Japan. The island's population was 497,973 as of the 2010 census, made up of mostly ethnic Russians and a smaller Korean community. The indigenous peoples of the island are the Ainu, Oroks and Nivkhs. Oxygen saturation is a relative measure of the concentration of oxygen that is dissolved or carried in a given medium as a proportion of the maximal concentration that can be dissolved in that medium. It can be measured with a dissolved oxygen probe such as an oxygen sensor or an optode in liquid media, usually water. The standard unit of oxygen saturation is percent (%). The sea is called Rìběn hǎi (日本海, literally "Japan Sea") or originally Jīng hǎi (鲸海, literally "Whale Sea") in China,  Yaponskoye more (Японское море, literally "Japanese Sea") in Russia, Chosŏn Tonghae (조선동해, literally "Korean East Sea") in North Korea, and Donghae (동해, literally "East Sea") in South Korea. A naming dispute exists about the sea name, with South Korea promoting the English translation of its native name as the East Sea. A dispute exists over the international name for the body of water which is bordered by Japan, Korea and Russia. 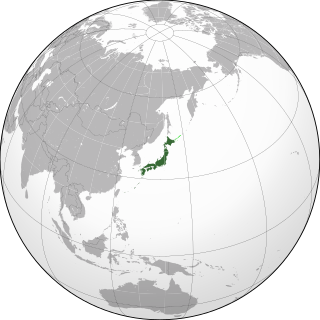 In 1992, objections to the name Sea of Japan were first raised by North Korea and South Korea at the Sixth United Nations Conference on the Standardization of Geographical Names. The Japanese government supports the exclusive use of the name "Sea of Japan" (日本海), while South Korea supports the alternative name "East Sea", and North Korea supports the name "Korean East Sea". Currently, most international maps and documents use either the name Sea of Japan exclusively, and far fewer maps include both the name Sea of Japan and East Sea, often with East Sea listed in parentheses or otherwise marked as a secondary name. The International Hydrographic Organization, the international governing body for the naming of bodies of water around the world, in 2012 decided not to change the current single name "Sea of Japan" rejecting South Korea's request to use "East Sea" together with "Sea of Japan". The largest bays are Peter the Great Gulf, Sovetskaya Gavan; Vladimira Bay, Olga; Posyet Bay in Russia; East Korea Bay in North Korea; and Ishikari (Hokkaidō), Toyama (Honshū), and Wakasa (Honshū) Bays in Japan. Prominent capes include Lazareva, Peschanyi (sandy), Povorotny, Gromova, Pogibi, Tyk, and Korsakova in Russia; Crillon on Sakhalin; Sōya, Nosappu, Tappi, Nyuda, Rebun, Rishiri, Okushiri, Daso and Oki in Japan;   and Musu Dan in North Korea. 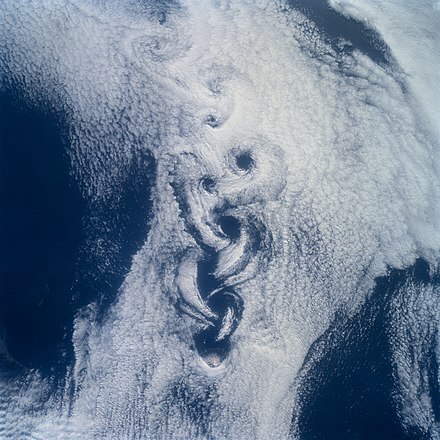 A peculiar turbulent cloud pattern, named von Kármán vortices, is sometimes observed over the Sea of Japan. It requires a stable field of low clouds driven by the wind over a small (isolated) and tall obstacle, and usually forms over small mountainous islands. The Sea of Japan meets these conditions as it has frequent winds and cloudy skies, as well as compact, tall islands such as Rishiri (1,721 m or 5,646 ft), Ulleungdo (984 m or 3,228 ft) and Ōshima (732 m or 2,402 ft). The mouth of Partizanskaya River near Nakhodka. View from Sopka Sestra [ ru ]. The Sea of Okhotsk is a marginal sea of the western Pacific Ocean, between the Kamchatka Peninsula on the east, the Kuril Islands on the southeast, the island of Hokkaido to the south, the island of Sakhalin along the west, and a long stretch of eastern Siberian coast along the west and north. The northeast corner is the Shelikhov Gulf. The sea is named after Okhotsk, the first Russian settlement in the Far East. 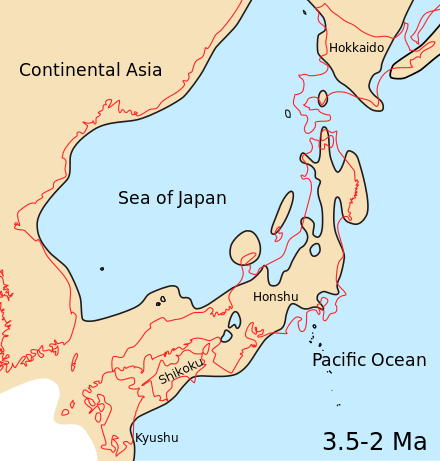 La Pérouse Strait, or Sōya Strait, is a strait dividing the southern part of the Russian island of Sakhalin (Karafuto) from the northern part of the Japanese island of Hokkaidō, and connecting the Sea of Japan on the west with the Sea of Okhotsk on the east. Strait of Tartary or Gulf of Tartary is a strait in the Pacific Ocean dividing the Russian island of Sakhalin from mainland Asia, connecting the Sea of Okhotsk on the north with the Sea of Japan on the south. It is 900 kilometres (560 mi) long, 4–20 m deep, and 7.3 kilometres (4.5 mi) wide at the narrowest point. The Korea Strait is a sea passage between South Korea and Japan, connecting the East China Sea, the Yellow Sea and the Sea of Japan in the northwest Pacific Ocean. 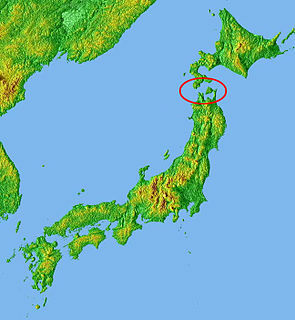 The strait is split by the Tsushima Island into the Western Channel and the Tsushima Strait or Eastern Channel. Tsushima Strait or Eastern Channel is a channel of the Korea Strait, which lies between Korea and Japan, connecting the Sea of Japan, the Yellow Sea, and the East China Sea. The Kuroshio (黒潮), also known as the Black or Japan Current or the Black Stream, is a north-flowing ocean current on the west side of the North Pacific Ocean. It is similar to the Gulf Stream in the North Atlantic and is part of the North Pacific ocean gyre. Like the Gulf stream, it is a strong western boundary current. Urup is an uninhabited volcanic island in the Kuril Islands chain in the south of the Sea of Okhotsk, northwest Pacific Ocean. Its name is derived from the Ainu language word for salmon trout. It was formerly known as Company's Land. 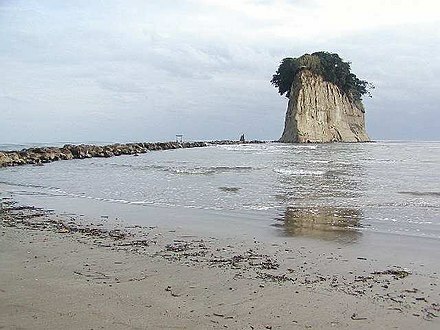 Moneron Island, is a small island off Sakhalin Island. Iony Island, or Jonas' Island, formerly Ostrov Svyatogo Iony, is a small island in the Sea of Okhotsk. The Spafaryev Islands, or Spafaryev Island, a relatively large double island, are located in the Sea of Okhotsk. It was formerly known as Korovi Island. It lies 7 km east of the Antamlan Peninsula, the southernmost peninsula enclosing the Taui Bay from its western side. Taui Bay is a body of water in the Sea of Okhotsk off the coast of the Magadan Oblast in Russia. The bay opens to the south. The Sakhalin–Hokkaido Tunnel is a proposed connection to link the Russian island of Sakhalin with the Japanese island of Hokkaido. Cost estimates by Russia in the year 2000 put the project to span the 45-kilometre (28-mile) strait at $50 billion. The Battle of Korsakov, a naval engagement of the Russo-Japanese War, was fought on 20 August 1904. 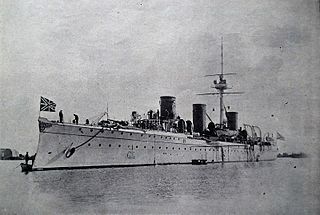 The battle foiled an attempt by the Imperial Russian Navy protected cruiser Novik at escaping Port Arthur to join the Russian cruiser squadron at Vladivostok, Russia, after the Russian Pacific Squadron was scattered in the Battle of the Yellow Sea. 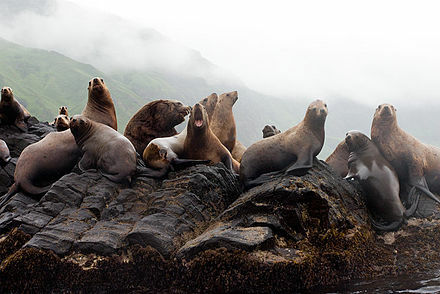 Ulban Bay is a bay in the northwestern Sea of Okhotsk, just south of the Shantar Islands. It is a southern branch of Academy Bay to the north. The Syran and Ulban rivers flow into its head. 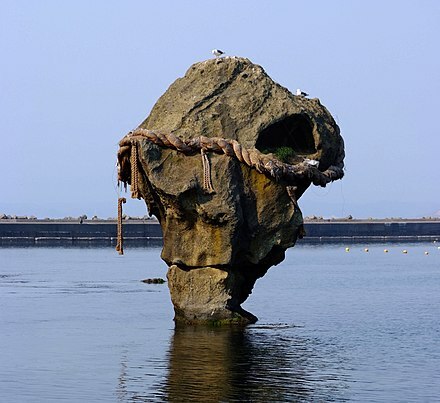 The Japan–Russia border is the de facto maritime boundary that separates the territorial waters of the two countries. According to the Russia border agency, the border's length is 194.3 km. Academy Bay is a large bay in the Tuguro-Chumikansky District of Khabarovsk Krai, Russian Federation. 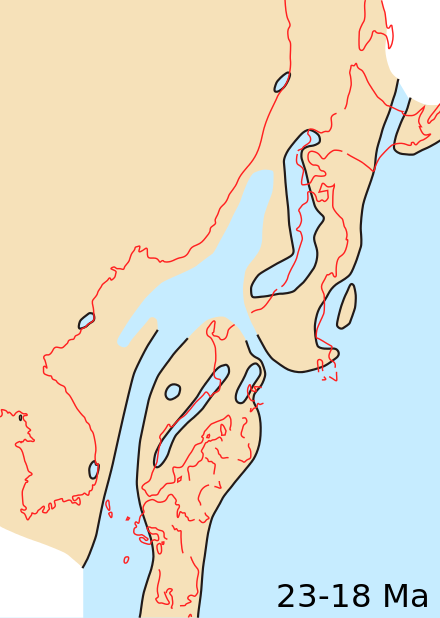 The Blakiston Line or Blakiston's Line is a faunal boundary line drawn between two of the four largest islands of Japan: Hokkaidō in the north and Honshū, south of it. It can be compared with faunal boundary lines like the Wallace Line. Certain animal species can only be found north of Blakiston's Line, while certain other species can only be found south of it. ↑ "Japanese Basic Position on the Naming of the "Japan Sea"". Japan Coast Guard. March 1, 2005. Archived from the original on May 24, 2011. ↑ "Legitimacy for Restoring the Name East Sea" (PDF). Republic of Korea Ministry of Foreign Affairs and Trade. Retrieved 28 September 2010. ↑ Kyodo News, "IHO nixes 'East Sea' name bid", Japan Times , 28 April 2012, p. 2; Rabiroff, Jon, and Yoo Kyong Chang, "Agency rejects South Korea's request to rename Sea of Japan", Stars and Stripes , 28 April 2012, p. 5. ↑ Vesper, of New London, Apr. 20-Aug. 26, 1848, G. W. Blunt White Library (GBWL); Northern Light, of New Bedford, May 14 – July 22, 1875, Old Dartmouth Historical Society (ODHS); Cape Horn Pigeon, of New Bedford, Apr. 17 – July 13, 1892, Kendall Whaling Museum (KWM). ↑ Splendid, of Edgartown, Apr. 17, 1848, Nicholson Whaling Collection (NWC); Fortune, of New Bedford, Mar. 12, 1849, ODHS; Sea Breeze, of New Bedford, Apr. 14, 1874, GWBL. ↑ Bowditch, of Warren, Aug. 2, 1848, NWC; Arnolda, of New Bedford, June 17, 1874, ODHS. ↑ Good Return, of New Bedford, Apr. 30, 1849, ODHS; Milo, of New Bedford, Apr. 16–18, 1850, ODHS. ↑ Eliza Adams, of Fairhaven, Apr. 21-Aug. 4, 1848, ODHS; Huntress, of New Bedford, May 4 – July 3, 1848, NWC. ↑ Florida, of Fairhaven, May 12–27, 1860, in One Whaling Family (Williams, 1964); Sea Breeze, of New Bedford, May 11–12, June 4–5, 1874, GWBL. ↑ George Washington, of Wareham, May 16, 1849, ODHS; Florida, of Fairhaven, May 5, 1860, in One Whaling Family (Williams, 1964). ↑ Daniel Wood, of New Bedford, Apr. 6, 1854, NWC. ↑ Henry Kneeland, of New Bedford, September 1, 1852, in Enoch's Voyage (1994), pp. 153-154. ↑ Complied catch in 1848 of Vesper (GWBL); Eliza Adams (ODHS); Splendid (NWC); Bowditch (NWC); and Huntress (NWC); in 1849 by Mary and Susan, of Stonington (NWC). ↑ Ships spoken in 1848 by Vesper (GWBL); Eliza Adams (ODHS); Splendid (NWC); Bowditch (NWC); Huntress (NWC); Liverpool 2nd, of New Bedford (NWC); Cherokee, of New Bedford (NWC); and Mechanic, of Newport (NWC); in 1849 by Huntress (NWC); Good Return (ODHS); Fortune (ODHS); Ocmulgee, of Holmes Hole (ODHS); Mary and Susan (NWC); Maria Theresa, of New Bedford (ODHS); George Washington (ODHS); Liverpool 2nd (NWC); Julian, of New Bedford (NWC); Henry Kneeland, of New Bedford (ODHS), Montpelier, of New Bedford (NWC), Cambria, of New Bedford (NWC), India, of New Bedford (ODHS), and Phoenix, of New Bedford (Nantucket Historical Association). ↑ Ships spoken in 1856 by Pacific, of Fairhaven (NWC), and Onward, of New Bedford (NWC); and from 1859 to 1861 by Florida, of Fairhaven, in One Whaling Family (Williams, 1964). ↑ Totman, Conrad D. (2004). Pre-Industrial Korea and Japan in Environmental Perspective. ISBN 978-9004136267 . Retrieved 2007-02-02. 1 2 3 4 5 6 7 8 9 Kameda Y. & Kato M. (2011). "Terrestrial invasion of pomatiopsid gastropods in the heavy-snow region of the Japanese Archipelago". BMC Evolutionary Biology 11: 118. doi : 10.1186/1471-2148-11-118. ↑ Park, S.-C; Yoo, D.-G; Lee, C.-W; Lee, E.-I (2000). "Last glacial sea-level changes and paleogeography of the Korea (Tsushima) Strait". Geo-Marine Letters. 20 (2): 64–71. doi:10.1007/s003670000039. 1 2 "Limits of Oceans and Seas, 3rd edition" (PDF). International Hydrographic Organization. 1953. p. 32. Retrieved 7 February 2010. Fukuoka N. (1966). "On the distribution patterns of the so-called Japan Sea elements confined to the Sea of Japan region". Journal of Geobotany [ es ]15: 63–80.